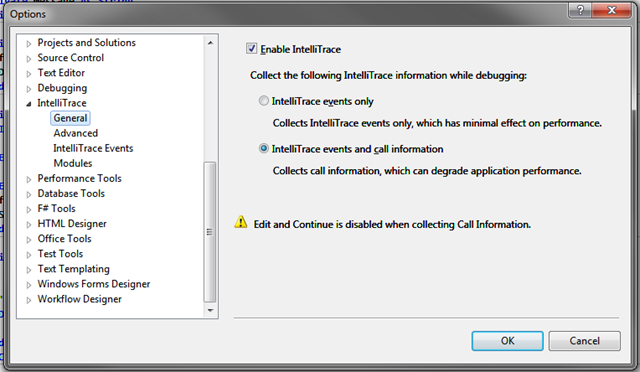 Visual Studio 2010 Ultimate now has IntelliTrace, which is a historical debugging feature. 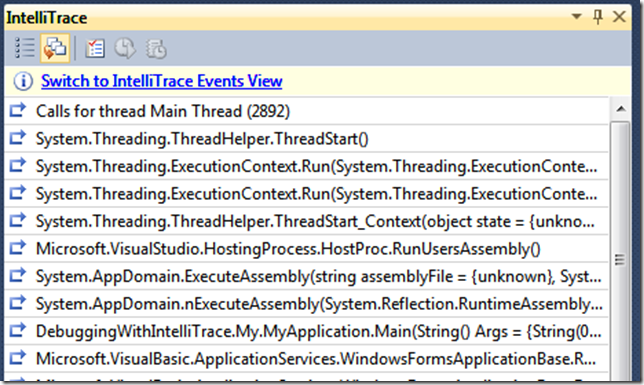 IntelliTrace will keep track of everything your code has been doing and then, when a bug arrives, you can back-track to the possible cause of the bug. 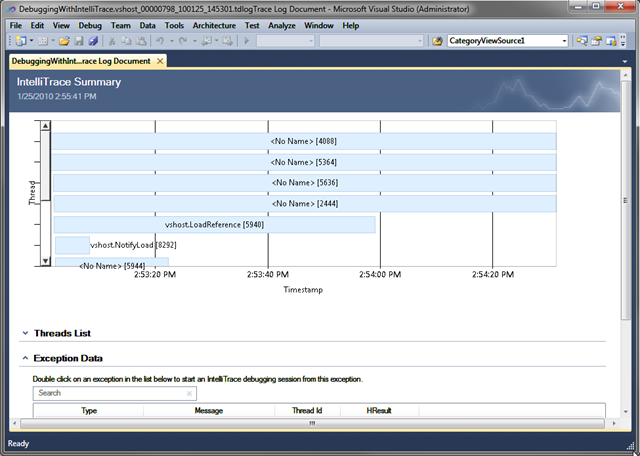 You might think this is nothing new, but don’t forget it also tracks the value of any variable at that moment in time. 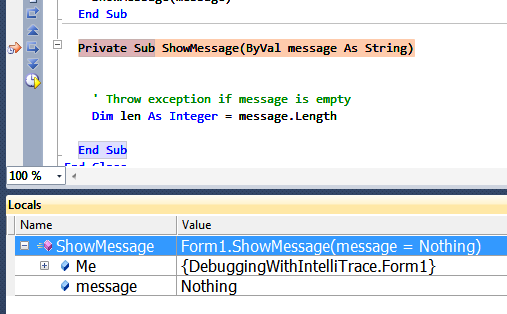 With the usual debugger you will see the latest value, not the value at that moment. 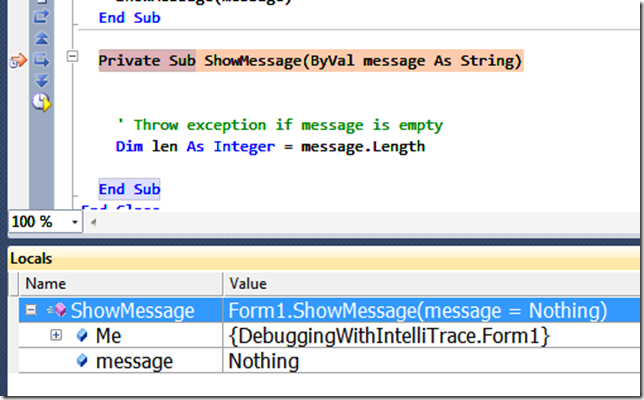 13:       message = "This should work"
See those special arraws in the gutter (the gutter is the section where you click to add/remove breakpoints)? These will allow you to backtrack. With these you can jump directly to one of your code’s stackframe. IntelliTrace keeps track of the values of the arguments and such, at each point in time. For example, a little higher in the code I changed the flag variable to true, while the bug is caused because it was false before. IntelliTrace will show me this. 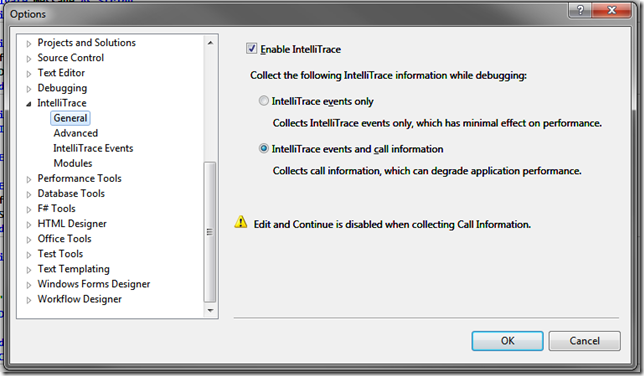 3:     message = "This should work"
IntelliTrace will save all of this information in a file (now with an extension called iTrace, notice the naming convention <GRIN>), and because you can open this file afterwards, all kinds of scenario’s can now be implemented. 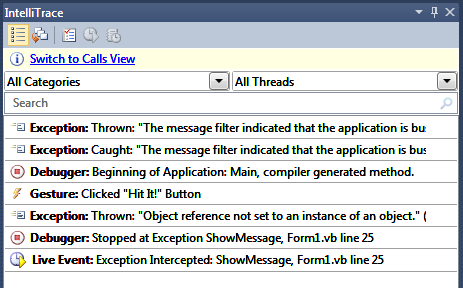 You can send the file to a colleague so he/she can help you debug the problem. 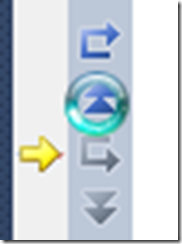 Open this directory in file explorer and copy the file to where you like. 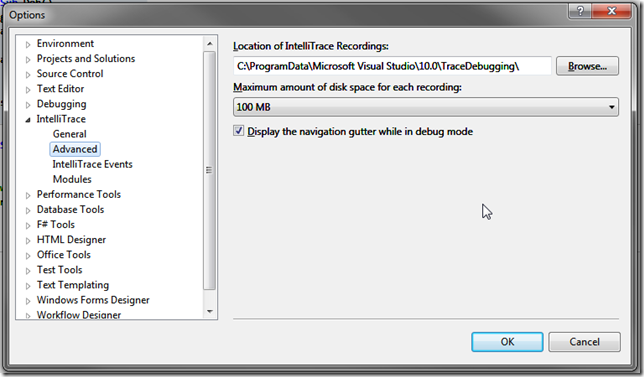 You will have to stop debugging, otherwise Visual Studio keeps a lock on the file. 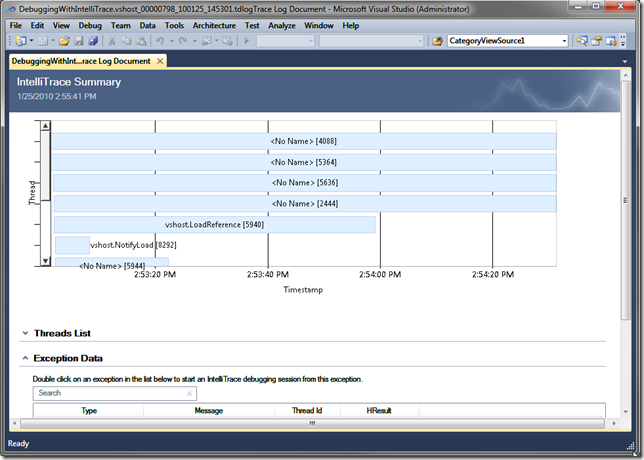 Don’t stop Visual Studio, because VS throws away the log file when it quits. 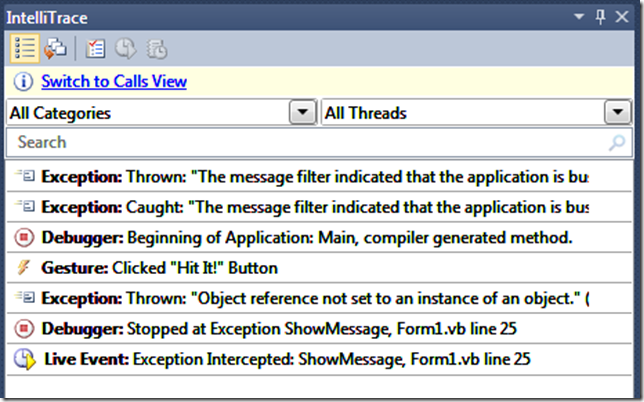 Double click it and with a little patience the debugger will open (make sure Visual Studio can find the sources). 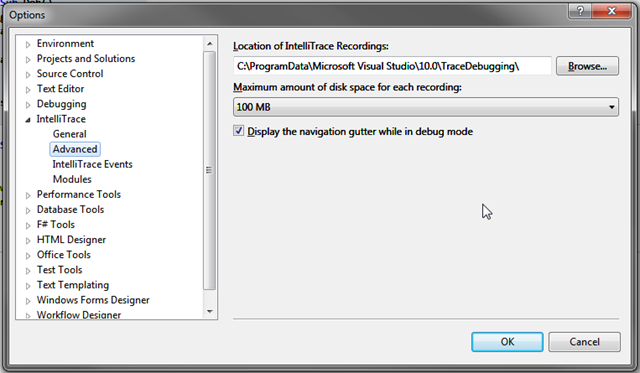 Or better even, the Visual Studio Test and Lab Manager 2010 can do this for you. 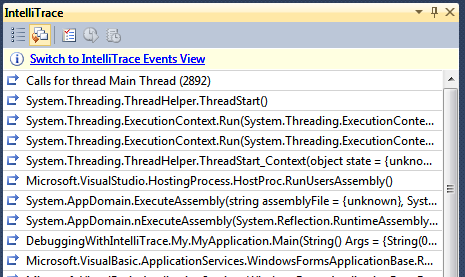 So even if you have a non-technical user who is testing some application, and finds a bug, the IntelliTrace file will be attached automatically!